Post-Script: The niece's husband tried his hand at the little Olympia SF, and he blazed away using the middle finger of each hand. It turns out his first book was written, years ago, on a larger Olympia, using the same typing style. He asked her why a typewriter, isn't a computer more efficient. 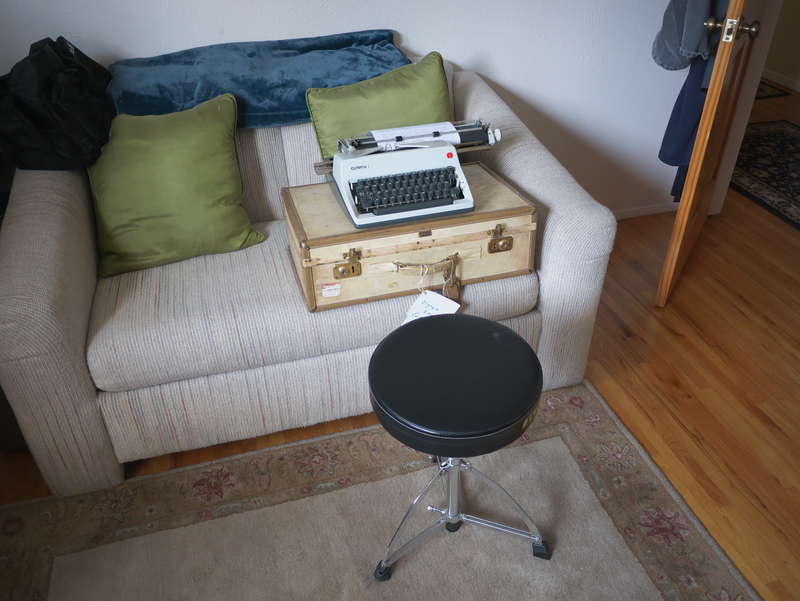 Her answer was something along the lines of wanting to get into typing again; she also has a desire to do some serious writing, and feels a typewriter would suit her best, as least in the initial phases. They both live an hour up the highway in Santa Fe; I told her in my letter that should she need ribbons or other assistance, just call. I think she made the right choice of the SM9 as a serious writing tool. Nothing wrong with the Smith-Coronas, except they're older, have seen a harder life. I also had her try Adobe Rose, the Royal QDL, seen above next to the Brother Charger 11, which still had its lid attached, one of her other choices. Unless portability were her main concern, she was wise to steer clear of the Brother, as it's not nearly as easy to type on. She made some interesting observations about the feel of the keyboards of these various machines. 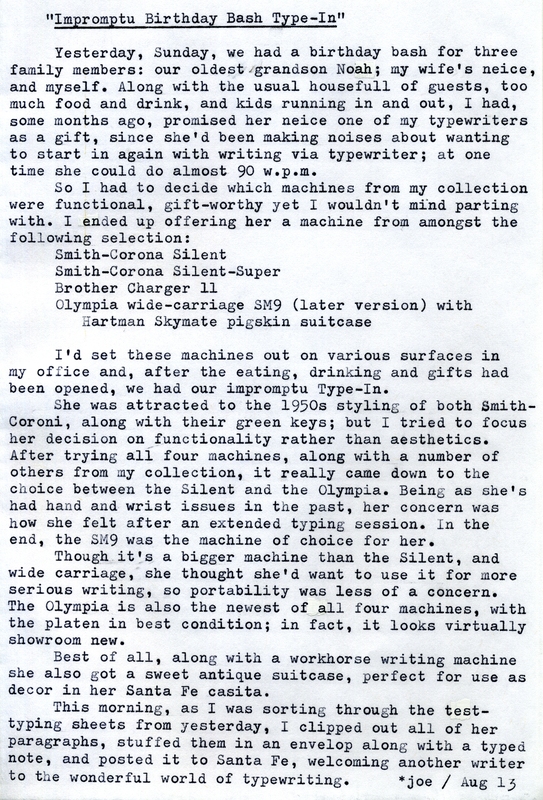 The spacing of the keys, and slope of the keyboards, has a lot to do with typing comfort, as she wisely discerned; to her, the SM9 felt easier than the Hermes 3000. 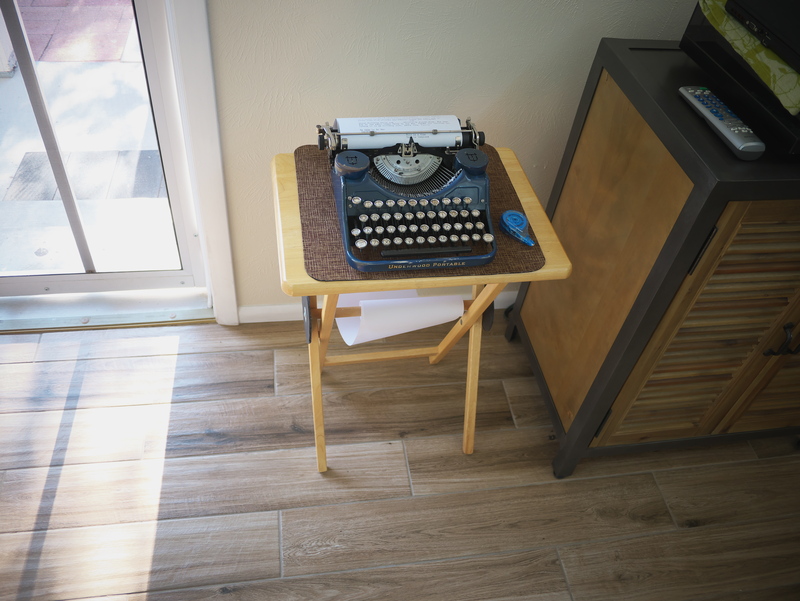 Above is the 1930 Underwood Portable with a roll of paper; we used it during the birthday party for people to type comments upon. Always a great machine to have handy. 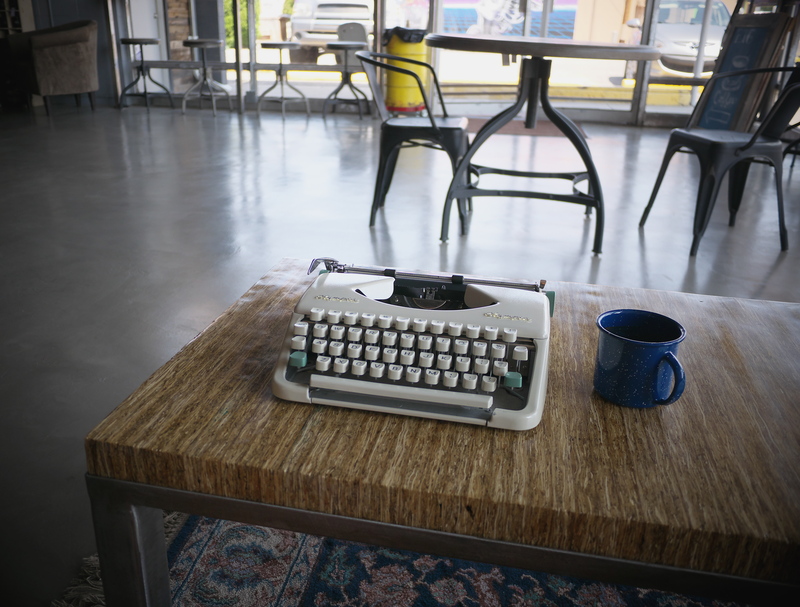 This morning I stopped in at Rust is Gold, a new coffee shop + artists collective, on Eubank near Constitution, with the Olympia SF, for some blog writing and coffee slurping. 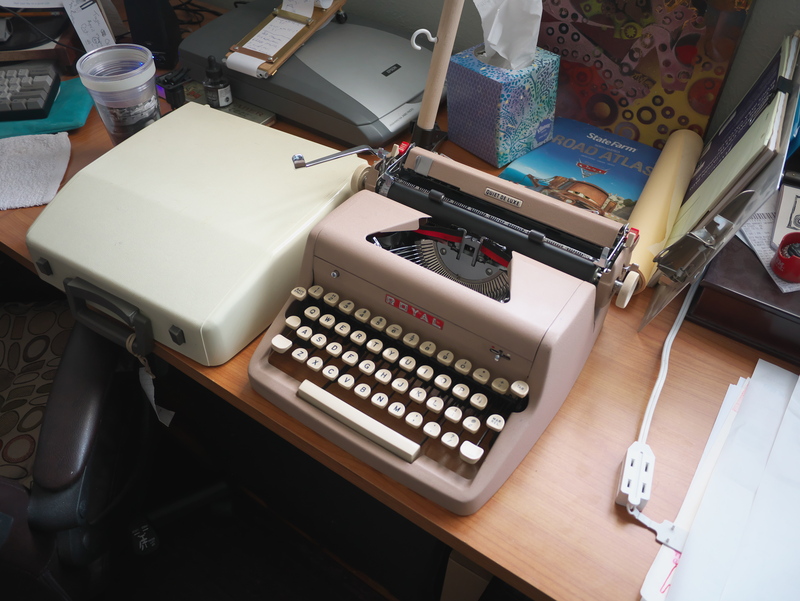 Fun was had, and I struck up a conversation with a fellow patron who was interested in the typewriter. I didn't have business cards with me, so typed him one on a scrap of paper. Even though I'm a bit late: Happy Birthday Joe! Neat. The SM9 was a great choice. Happy birthday! Belated happy birthday to you, Joe!